Starting a new superhero universe is a risky endeavor in a comic book marketplace crowded with superhero titles, but Lion Forge Comics has put a lot of thought into the development of its Catalyst Prime line. Edited by Joseph P. Illidge III, a former editor for DC Comics’ Batman line and Milestone Comics imprint, Catalyst Prime is actively addressing the lack of representation in superhero comics by hiring women and creators of color to build this world. The leads for the seven Catalyst Prime ongoing series (a new title will debut each month through the end of the year) come from a variety of backgrounds, and it’s refreshing to see a superhero comics publisher acknowledge the hunger for a wider range of character experiences and commit to satisfying it. Catalyst Prime kicked off last week with two new releases: A Free Comic Book Day one-shot, Catalyst Prime: The Event, setting up this universe and its characters, and Noble #1, the first of the seven ongoings. Co-written by Illidge and Christopher Priest, The Event has the density readers should expect from a Priest comic, and while it successfully lays a lot of groundwork, the stiff artwork from Marco Turini and Will Rosado prevents the story from reaching its full potential. Noble #1 (Lion Forge Comics) is a very different book, placing less emphasis on plot to deliver a thrilling action sequence that gives readers a bold first impression of the lead character. Writer Brandon Thomas doesn’t spend much time on exposition, and after a quick prologue introducing Astrid Allen-Powell, the story flashes back one year to show Astrid’s husband, David, fighting a gang of mercenaries in Argentina. The majority of this issue is one big fight revealing the scope of David’s psychic abilities, and it’s an exciting start to the series that makes readers want to learn more about this superpowered amnesiac. Artist Roger Robinson and colorist Juan Fernandez have sharp action storytelling skills that give the issue powerful momentum, and Thomas puts the focus on the visuals by using minimal dialogue and no narration. There’s admirable restraint in the scripting, and when there is dialogue, it’s mostly used to provide important background information that contextualizes the fight. The action is the selling point of this issue, and the creative team successfully establishes David as a total badass, even though he doesn’t have complete control of his powers. The two-page spread of David breaking his handcuffs is a striking encapsulation of his strength; this surge of energy sends him shooting into the sky and away from his attackers. Unfortunately, he doesn’t know how to land, and he comes crashing down in a four-panel sequence that breaks down his fall in clear, painful detail. Robinson’s layout and linework create dynamic movement on the page, while Fernandez’s warm color palette adds intensity, and letterer Saida Temofonte does exceptional work creating evocative sound effects that are smoothly integrated into the linework. The Noble team understands the value of riveting action in superhero stories, and as the story delves deeper into David’s past and his relationship with his wife and son, hopefully it won’t forget to keep the fisticuffs coming at a steady rate. With shorter, self-contained stories, anthologies can be good the same way tasting menus are, providing small quantities of a lot of different types of comics. But because of the variety of talent and skill in every book, they can also be uneven and lack a good flow that keeps readers going from one comic to the next. Thankfully, there’s a growing population of small publishers that excel at compiling and editing anthologies of many stripes. Taneka Stotts is one of these talents, co-editing the hugely successful Beyond Anthology and, with Sfé R. Monster, creating Beyond Press. 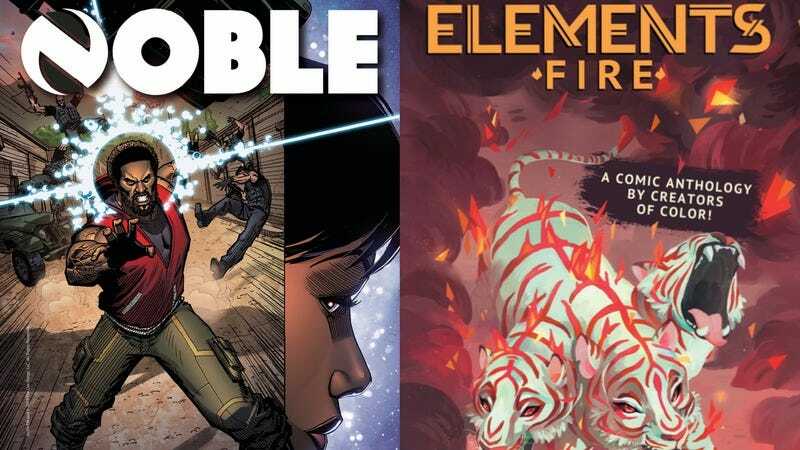 Where Beyond focused specifically on sci-fi and fantasy stories from LGBTQ creators, Stotts’ latest project, Elements: Fire, (Beyond Press) does the same for creators of color. The comics are all short, no longer than 15 pages, but the storytelling is for the most part tight and graceful, the product of trimming as much fat as possible and sticking to only what is necessary. This is the result of not just Stotts’ skill as an editor but also her eye as a publisher. She recruited a variety of talents for Elements, and most of them are consummate storytellers with proven abilities that deserve more exposure. What sets Elements apart is that rather than being in simple grayscale, the book also features a single shade of red. Some of the artists opted to use the red in shading or by diluting it, but the uniformity of the color palette makes the book a lot more cohesive and smoother to read than some anthologies that feature full-color art in dozens of different styles. It’s particularly fascinating to see artists like Der-Shing Helmer, who features incredibly textured and varied colors in her own webcomics, working within this limitation. It draws the eye to composition and framing, bringing to the forefront those artists who can tackle kinetic movement or expressions with deft skill and confidence. Helmer’s “Pulse” is one of the standouts of this volume, along with “Metta Helmet” by Deshan Tennekoon and Isuri Merenchi Hewage; Chloe Chan and Nina Matsumoto’s “Preta”; and “Breath, Plucked From Heaven” by Shivana Sookdeo. There are several lovely stories focused on children, girls especially. The volume also features a bittersweet story from Sara DuVall, who along with Stotts, was nominated for a 2017 Eisner Award for the webcomic Deja Brew. Stotts and assistant editor Shing Yin Khor write eloquently in the foreword about the frustrations that marginalized creators face when trying to break into the comic book industry, a message that was also featured in Beyond. It’s increasingly frustrating that in order to find these incredible talents, readers have to dig long and hard, and creators have to run their businesses themselves. But with editors like Stotts pushing the industry to improve and become more inclusive, it’s hard not to have hope of seeing these names backed by increasingly larger publishers in the future. What’s even better is that Beyond Press itself continues to grow, with Beyond 2 launching on Kickstarter this week. Over the last few years, the Japanese cartoonist Gengoroh Tagame has slowly made inroads with American readers. Given the nature of his work, which largely concerns the sexual exploits of burly gay men, this may seem surprising. But Tagame’s clean lines, command of the comic form, and effortless aesthetic make his comics eminently readable—all reasons that his work has cultivated a readership beyond just those interested in the more sexually gratifying aspects. Tagame’s latest, however, may come as a bit of a surprise to readers more accustomed to that explicit work. In My Brother’s Husband Vol. 1 (Pantheon Graphic Novels), the author tells an all-ages story about Yaichi, a single Japanese father whose prejudices are challenged when he meets the husband of his recently deceased brother. Like Tagame’s other work, the lives of gay men take center stage here. But whereas the pornographic work approaches male bodies (larger, hairier bodies in particular) on a strictly physical plane—something that both desires and is desirable, as the oft-ignored site of pleasure—My Brother’s Husband concerns itself more with the emotional lives of gay men. One scene in particular serves as a lodestar to this point: Mike, the titular husband of Yaichi’s brother, offers some solace to a boy reluctant to come out to his friends and family. Mike is the first out man the boy has ever met, and the meeting is profound for him. The scene serves to crack open Yaichi, and he and the reader are able to understand some of the anxieties related to coming out a little better. Even those who believe their family is caring and open, as Mike explains, may be reluctant; opening yourself to pain and making yourself vulnerable to cruelty remains an act of courage. Tagame’s clear cartooning guides readers through this scene, offering them a sentimental aside that stops just short of overplaying its hand. His characters’ acting is subtle, but their range is vast. He offers a strong sense of their interior lives, though he never hits the kinds of cheap, melodramatic highs that would reduce the scene to a cliché. Instead, these men are given rich and complex lives, pain mixed with equal parts joy, lust, and confusion. Mike, a Canadian, was raised in a more liberal culture, so his experience of coming out and being out are vastly different from what the publicity copy of My Brother’s Husband describes as “a largely still-closeted Japanese gay culture.” And here Tagame addresses slight aspects of cultural difference that help to shape the space, or lack thereof, that queer people are afforded in public life. The scene evinces the elegance of Tagame’s storytelling, and it serves as a high point for the book. While it’s unclear how Tagame will sustain this narrative through a presumed second volume, the first offers a rich and textured narrative whose sleek aesthetic is surpassed only by its cordiality. There was a time when Mark Waid would have been a perfect fit to write the Avengers. Unfortunately that time was 1995, when the franchise reached the nadir of a long decline punctuated by the book’s cancellation. It was relaunched by Rob Liefeld as part of the infamous Heroes Reborn initiative in 1996, and a year later re-relaunched by Kurt Busiek and George Perez. Waid wrote the last three issues of the series’ first volume. Now it is 2017 and neither Waid nor the Avengers are quite what they once were. Waid is still capable of writing decent comics, as his recent runs on Daredevil and Black Widow have proven. His return to Marvel’s flagship franchise—co-writing with Princeless creator Jeremy Whitley—has proven significantly less auspicious. Just as his brief mid-’90s run was marred by having to balance a set of awful costumes and disastrous status quo changes for Earth’s Mightiest Heroes, his current run is similarly hampered by having to write an Avengers book with a decidedly unorthodox team of Avengers. It should be stressed that there’s nothing wrong with these characters. Calling them “replacements” hardly does justice to strong characters like the Jane Foster Thor, Sam Wilson Captain America, and Nadia Pym Wasp. But the presence of all three alongside billionaire Spider-Man and Victor Von Doom cosplaying as Iron Man points to a massive weakness in Marvel’s current lineup. Change is good, new and refurbished characters are good, diverse characters are good—but what isn’t quite so good is changing every marquee character across the line at once in such a way that the books appear to be staffed by strangers and written by people who have lost the ability to tell a story that doesn’t involve shattering the status quo. Avengers #7 features Doom-as-Iron Man asking the Avengers for help with a mysterious magic menace in upstate New York. The issue is not without some degree of wit. Waid and Whitley write Spider-Man well (the antipathy between Spidey and the current Wasp is a deep cut going back to the original Wasp’s dislike for him in their earliest team-ups), and the co-writers are smart to allow the new Wasp’s hero worship of Dr. Doom drive both the story and the intra-team conflict that expectedly erupts when Dr. Doom asks for help driving a coven out of a girls’ sleepaway camp. It’s an odd book—competently written with a complete story and good characterization but also totally unsatisfying as an Avengers story. Phil Noto’s art suffers from the same weaknesses as usual: He is a strong designer with an excellent grasp on expression and body language—no small challenge for many superhero artists—but a definite weakness with action scenes, which often seem either mannered or confused. The book points to nothing so much as the company’s need for a stem-to-stern overhaul—thankfully imminent, via the upcoming Legacy rebranding. These are good characters, and good creators, but staffing the marquee Avengers title with legacy heroes and off-brand iterations of old favorites nevertheless seems like a poor fit, and a stopgap on the way to the inevitable back-to-basics. That’s no judgment on Whitley, who could probably kill on a book with these same characters that wasn’t also carrying the cursed chalice of writing the company’s flagship right before the next Heroes Reborn.